The International Space Station with the Space Shuttle Atlantis docked on the right and a Russian Soyuz on the far left in 2011. In 2018, a new atomic refrigerator will blast off for the space station. It's called the Cold Atom Lab (CAL), and it can refrigerate matter to one ten billionth of a degree above absolute zero, just above the point where all the thermal activity of atoms theoretically stops. "At this temperature, atoms lose their energy and start to move very slowly," explains Rob Thompson, CAL Project Scientist at NASA's Jet Propulsion Laboratory (JPL). "At room temperature, atoms bounce off each other in all directions at a few hundred meters per second. But in CAL they'll slow down a million-fold and condense into unique states of quantum matter." CAL is a multiuser facility that supports many investigators studying a broad range of topics. Eric Cornell, a physicist at the University of Colorado and the National Institute of Standards and Technology, will be leading one of the first CAL experiments. Cornell and his team will use CAL to investigate particle collisions and how particles interact with one another. Ultra-cold gases produced by the Cold Atom Lab can contain molecules with three atoms each, but which are a thousand times bigger than a typical molecule. This results in a low-density, "fluffy" molecule that quickly falls apart unless it is kept extremely cold. How is particle behavior affected as more particles are introduced? What can be learned about quantum objects when several atoms are interacting at the same time? Cornell says, "The way atoms behave in this state gets very complex, surprising and counterintuitive, and that's why we're doing this." Cornell shared the 2001 Nobel Prize in physics for creating Bose-Einstein condensates – another state of quantum matter that can be studied inside CAL. Bose-Einstein condensates are essentially blobs of quantum matter that look and behave like waves that exist at these ultra-cold temperatures. 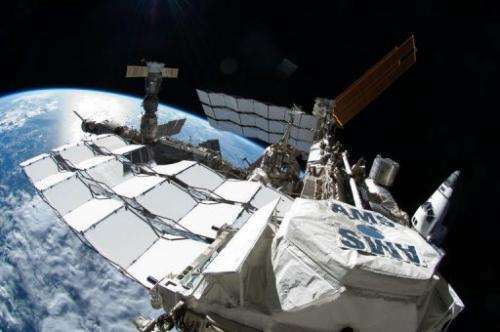 In the freefall of space, the condensates can hold their wavelike forms for five to ten seconds – much longer than on Earth – providing researchers a window into the quantum realm. Thompson says, "We can use CAL to test general relativity and quantum mechanics. One of the biggest questions in physics today is how those two work together." University of Rochester physicist Nick Bigelow, and University of Berkeley scientist Holger Müller along with their colleagues plan to use CAL to test a cornerstone of Einstein's theory of relativity – the equivalence principle, which holds that gravity and external acceleration cannot be distinguished experimentally. They plan to repeat Galileo's iconic experiment dropping cannon balls off the Leaning Tower of Pisa, but using atoms instead. Dropping atoms inside CAL and letting them fall for several seconds as the station orbits Earth will allow researchers to precisely figure out the differences between how the atoms accelerate. This experiment may reveal how gravity and space-time are woven through the quantum realm. A researcher at JPL named Jason Williams also plans to use ultracold two-atom molecules to develop tools for the next generation of precision gravity tests with quantum gases. Many more experiments are planned for this "cool" new laboratory – and no one knows where they will lead. "With CAL," says Thompson, "We're entering the unknown."